All great adventures start with a single small step! This helpful guide will take you from the very beginning: creating and setting up your account to creating your first Pitchbox campaign. The first step is to log in to your Pitchbox account. After you have successfully logged in, the first screen you will encounter is the Account Settings/Email Accounts page where you will be prompted to invite team members. Enter the names and email addresses of each individual you want to invite to have access to your Pitchbox account. They will receive invites to Pitchbox via email. Team members can collaborate together on outreach campaigns to maximize efficiency. Each user gets their own login. Outreach managers can measure users' activity through performance reports. The next step is to name your workspace and input your domain or your client’s domain that you'll be doing outreach for in that project. Now that you have connected an email account and assigned it to your project, you will be redirected to the campaign screen to set up your first campaign. *If a campaign has already been created by you or a team member, you will remain on the email accounts screen after you have connected an email account. In that case, you will want to click on the Project drop-down at the top of your screen and select your project. This will direct you to the Campaigns screen for your Project. There are several campaign types you can choose from including Blogger Outreach, Advanced Operator Search, as well as CSV Import campaign, and many others. You can run Integration Campaigns if you have an account with Link Research Tools, Ahrefs, or Majestic and connect it to your Pitchbox account. 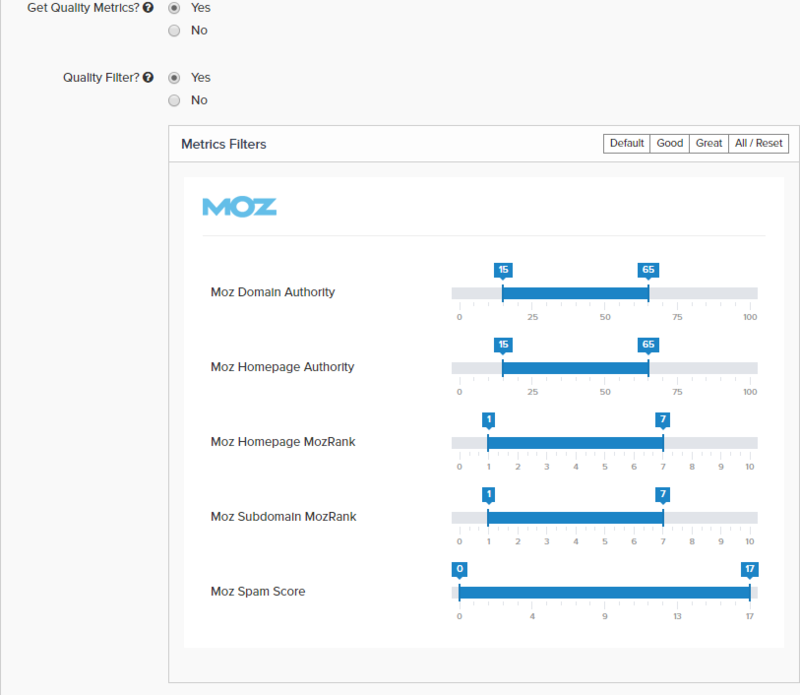 Moz integrated campaigns are available with every account! Click "Create" under the campaign that you wish to set up. Give your campaign a name. 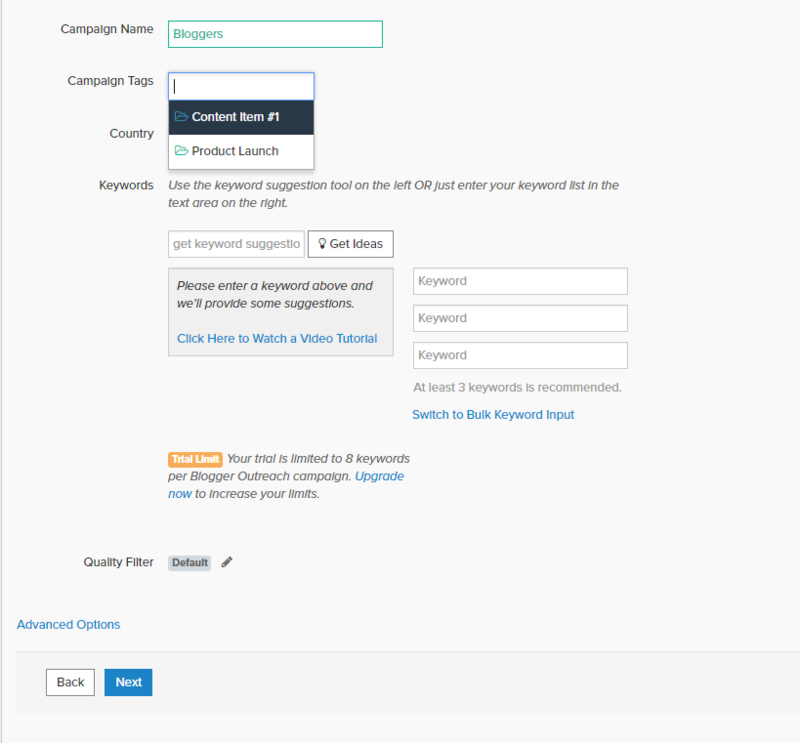 You can tag your campaign with one of our preset tags available: Content Item #1 or Product Launch. You can also add and create your own tags at the account level. The next step is to enter your keywords - or, import your file depending on the type of campaign you are setting up. If you are importing your prospects, here's how to get started: CSV Import Campaigns. Pitchbox searches in real time to bring you the most relevant results based on your keywords. It is always recommended that you use targeted, long-tail keywords. The more specific and focused you can get, the better. To edit the parameters of your search, click the pencil icon next to Quality Filter. You can set your own metrics range, or if you prefer you can select one of our preset settings. The filter is essential in determining the type, ranking, and quality of opportunities you are looking to target. 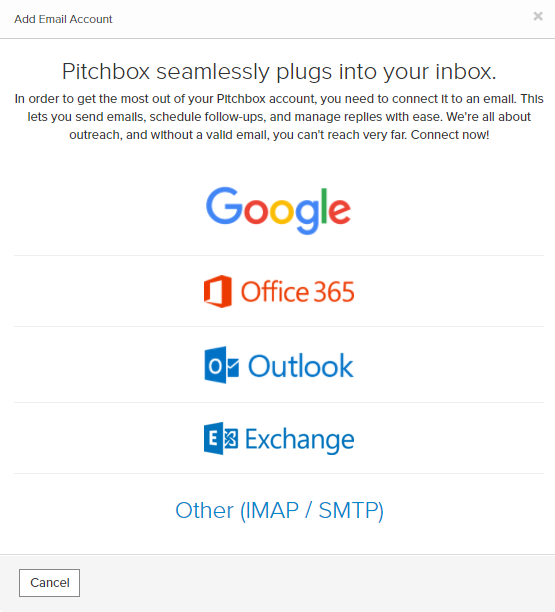 Every Pitchbox account comes integrated with Moz. Pitchbox also integrates with other SEO tools like SEMRush, Majestic, and Ahrefs. Once you add those integrations, you will be able to filter by their metrics as well. You're almost ready! Finally, select Advanced Options at the bottom of your screen to further customize your campaign. 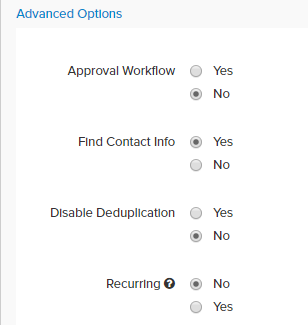 Approval Workflow gives outreach managers the opportunity to directly oversee the activity of their team through the campaign workflow. Find Contact Info tells Pitchbox to discover the contact information for each opportunity. 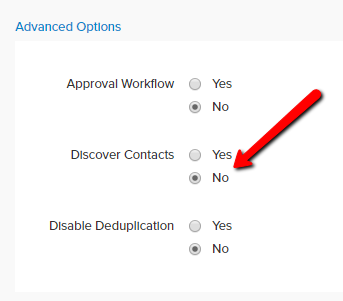 Disable deduplication will turn off Pitchbox’s default setting to de-duplicate prospecting results. To learn more about how deduplication works, see: How Does Deduplication Work? *For a CSV import, remember to make a decision for the option to turn Find Contact Info on or off in case you want to import your contacts only. Click Next and prospecting will begin! The campaign search generally takes a few minutes. Within a few seconds, opportunities will begin to populate in the background. While the search takes place, it’s time to set up your email templates. As long as you have an email account connected, you will be directed to create your first template. For more on how to create templates, see Creating Your Templates and Campaign Settings: Templates and Email Sequence. 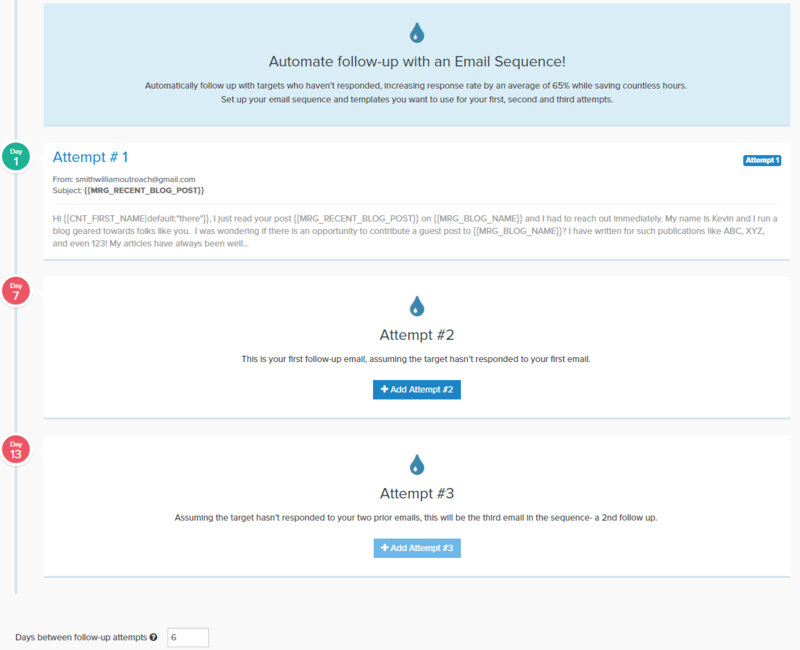 Once you have created and saved your first template, you will be redirected to the Templates and Email Sequence screen where you can add your subsequent follow-up attempts. We have seen a 65% increase in responses when users send out follow-up emails. After you have created your follow-up attempts, designate the days you would like to wait in-between attempts. Click on Save.